I can’t believe in all these years I have never written a post on how to choose the perfect white paint color for trim throughout your home. It’s real easy for me and my clients because from my experience, there are only 3 whites that I use, love and recommend to my clients for painting trim. Today I wanted to share with you guys which colors I think are the 3 best white trim paint colors and explain why we only work with these colors. 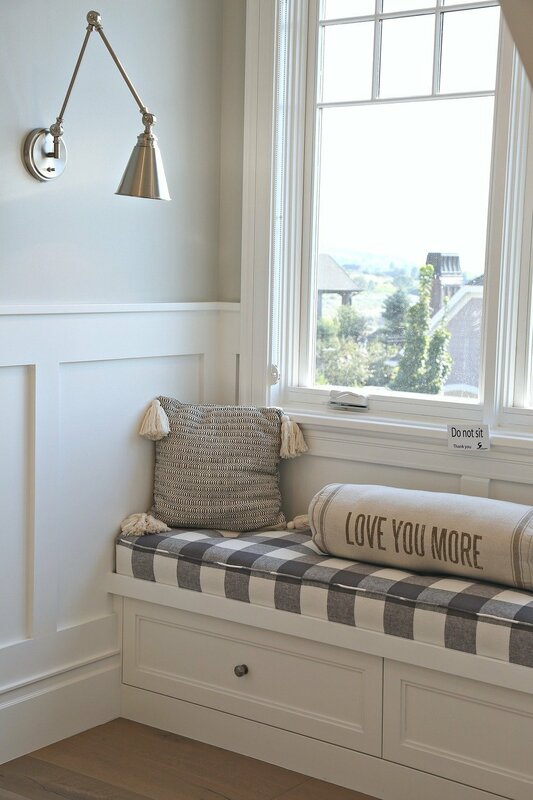 Over the years, I have tried all of the popular white trim paint colors that I’m sure you guys have all heard of including; Benjamin Moore Dove White, Benjamin Moore Cloud White, ect.. When I moved into my home back in 2000, all of our trim was painted Sherwin Williams Dover White. Back 10-20 years ago, every contractor and designer was using Dover White for the main trim color. Even to this day, I still see home builders using Dover White on trim. Dover White is the WORST shade of white for trim because it’s a dirty white and on the trim it looks dirty, dull and dirty. Did I mention dirty?! It does absolutely nothing for trim and the color in no way enhances a space or a wall color. Quite the opposite! By the way, Dover White can be really pretty on a wall. I don’t totally hate this color. White trim looks best when it’s a subtle crisp white contrast to the wall color but not so crisp and bright of a white that is a bright jarring white. The magic happens in a space with that subtle crisp white and details pop out in the trim work and the wall color is beautifully complimented. On a side-note, I always recommend to my clients that it’s best stay away from creamy off-white’s for trim color, unless we choose a white with the subtlest of neutral undertones or we a choosing more of a color. Lucky enough, most of the time I can convince them to compromise with Benjamin Moore Simply White (more on Simply White below), which has the slightest hint of warmth in the undertone. If you really sure you want an off-white trim color, I have a trick for instantly spotting undertones in whites/off-whites here. There are really only two circumstances in a home that impact the brightness/crisp-ness of white trim in a home; 1) The home is filled with a lot of natural light, and 2) The home does not have a lot of natural light. In homes that are filled with an abundance of natural light, white will naturally be brighter, so it’s important to choose a white with a very subtle hint of warmth that would not go jarring bright in all the natural light. In spaces where there is average to minimal natural light, it’s important to choose a white that is brighter and would greatly help lighten a space without being jarring bright. So to help, I am breaking down the three best white trim paint colors that I use by; 1) bright, 2) brighter and 3) brightest to help talk you guys through this. 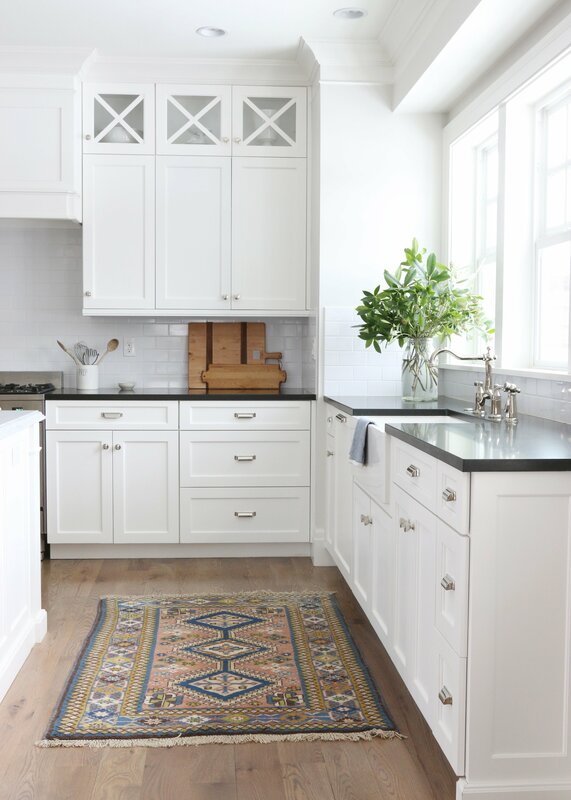 In spaces where the home is filled throughout with a lot of natural light (which I rarely see) I recommend Benjamin Moore Simply White because it’ a softer white with that very subtle neutral-ish undertone (even though it does have a slight tad of warmth). 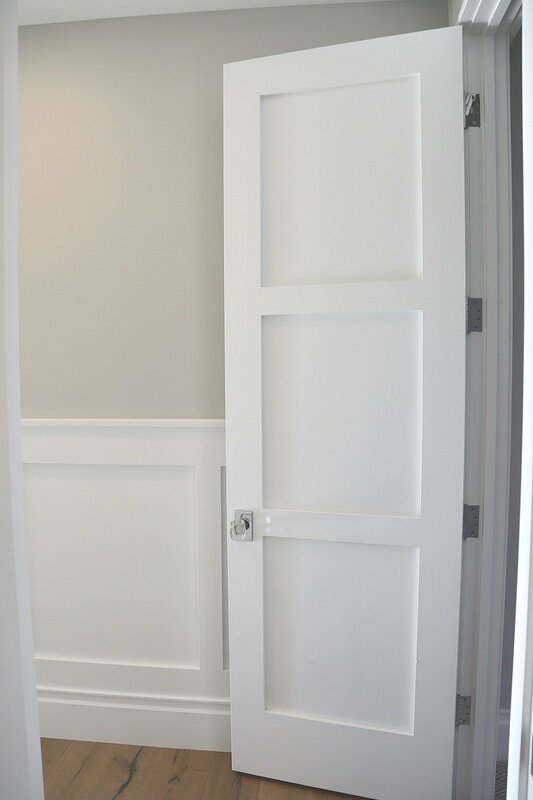 Simply White will help balance/diffuse the abundance of light that can causing the white trim to look too bright. The abundance of natural light makes Simply White appear brighter/lighter. Recently, my client built a home that was full of an amazing amount of natural light. Strong natural light flooded almost every room in the home and I advised my client to use Simply White on her trim and cabinetry throughout her home to offset all the natural light that would make her whites even brighter. As you can see below, while Simply White is not even close to being a bright white, but mixed in with the natural light (and the lights turned on) you can it’s crisp with just the right amount of brightness. The Studio McGee kitchen has a lot of natural night and you’ll notice that the shade of white is absolutely perfect and no strange undertones jumping out! Not too bright and not too dull and all that natural light brightens Simply White, which in a space with no natural light could be too subtle of a white/lacking that crisp-ness. Also, in this space below (my client’s master bedroom), you’ll notice how much natural light comes in the windows and doors. Simply White on the trim, door and ceiling is brightened up enough that it’s just the right shade of white to enhance that wall color (Sherwin Williams Sea Salt). See how the white is still crisp but not too bright and Simply White has that neutral-ish undertone that in natural light looks like a true white. The office below was painted with Benjamin Moore Beach Glass and this was one of the only rooms in my client’s home that didn’t have a lot of natural light. You can see that Simply White appears just a little duller. While it’s still pretty and a true white, it’s not as crisp as the other spaces in the home. However, we needed to carry the same color through the home. If my client had a home with less natural light like the office above, I would not have recommended Simply White but rather Decorator’s White (see below). In homes that do not have a lot of natural light consistently throughout (probably most of our homes), I use and recommend Benjamin Moore’s Decorator’s White because it’s a brighter beautiful neutral white (but not too bright). I use Decorator’s White to instantly lighten up a space via the trim, interior doors and cabinetry and it compliments every wall color. It also has the subtile crisp-ness that I mentioned at the beginning that is updated, fresh and helps to make a space light and airy. Decorator’s White is a cool white with a very slight gray undertone that makes it one of the most neutral whites that I use. In another client home below, we used Sherwin Williams Repose Gray on the walls throughout the home and all the trim work, cabinetry and interior doors were painted with Decorator’s White. While there is a lot of windows and natural light in this home, the home has a lot of trees around it and there are some areas where the natural light is not as consistent and strong. You can see how Decorator’s White in this space again is a true beautiful white that is not jarring white but more of a subtle bright white. 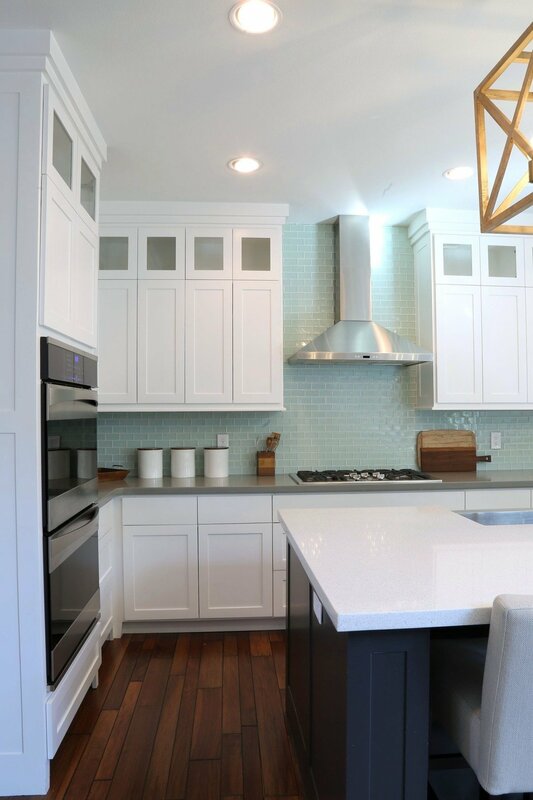 You can really see what I mean by looking at the kitchen in my client’s home where all the cabinetry and trim are painted with Decorator’s White. 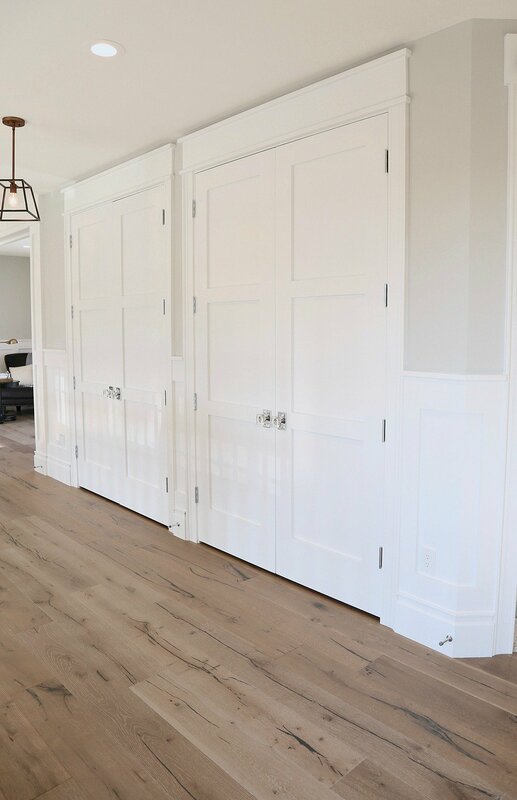 For those people looking who want a gorgeous even brighter/crisp white for trim, cabinetry and doors, I recommend Benjamin Moore Super White. Personally, I think Benjamin Moore Super White is as bright of a white as I think anyone should go (yes, there are brighter whites). I love this color in spaces that do not have an abundance of natural light and want to greatly lighten things up in the space. 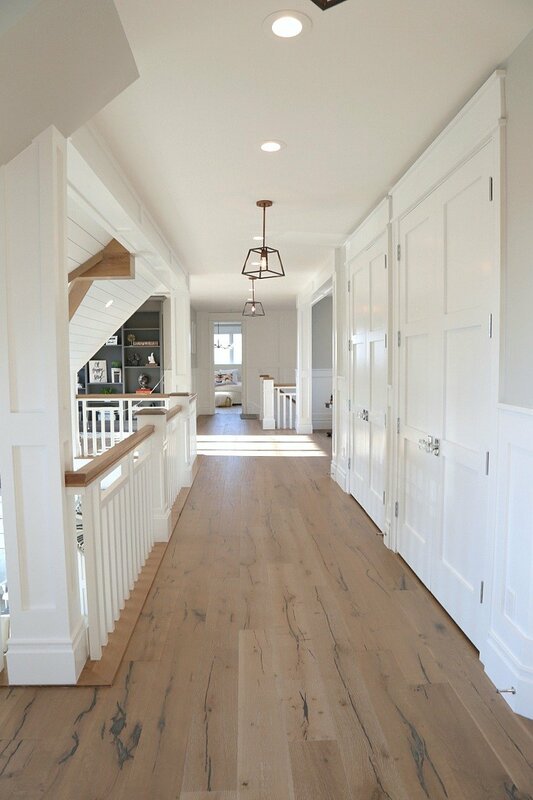 You can see below how this darker hallway is really brightened up with Benjamin Moore Super White on the trim and doors. It’s so fresh, light and really updated! You can also see below how Super White is a brighter very crisp white that really enhances the wall color as well. I really hope this helps as you choose trim, cabinetry and interior door colors. 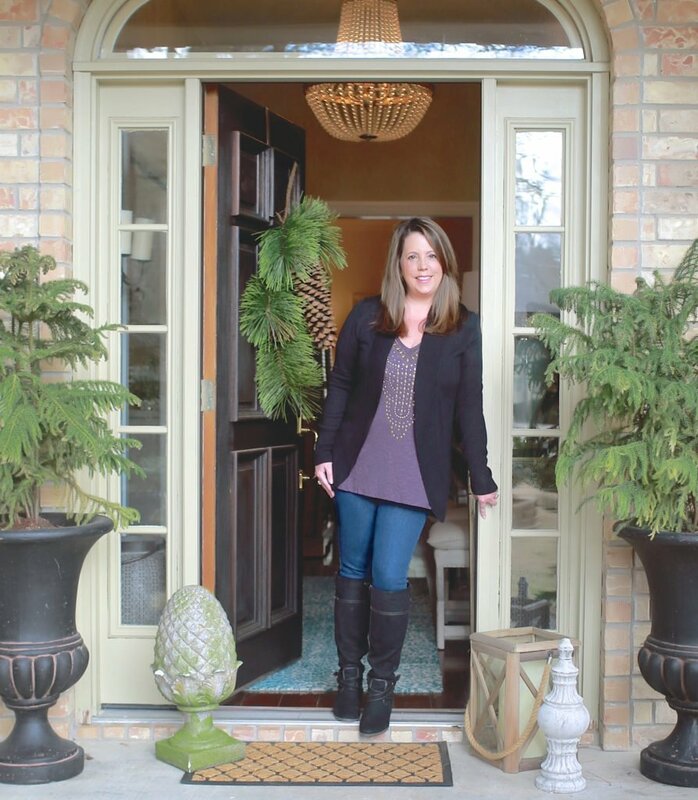 If you’re looking for more tips for choosing paint colors or my “Go-To” colors, you can find my list here. What about Sherman Williams shades for white trim? 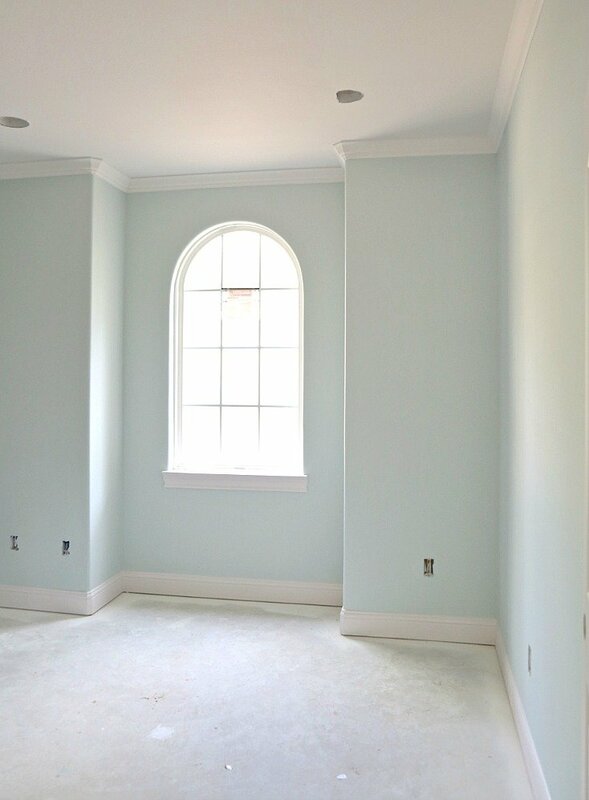 I used Snowbound for all the ceilings and trim in my house and love the soft white it gives me. In your last photo I would like to know the brand and stlye of the floor used as well as the wall color. I m in love!! I agree the floor is beautiful. Would love to know the product information. I ended up trying hard to match the Anderson window white. Interesting how light effects the undertones of it in different rooms. I lived with a decorator white on the trim in all the rooms despite my saying I wanted the trim to match the white windows. And even though I have a few rooms where I don’t like the Anderson white, it’s much better than the glaring decorator white contrast in the windows. Do you match paint trim color to the windows? I am currently building a sunroom onto our house and was planning on using Andersen white…until I realized how gray it is. Sherwin Williams matched it to Frosty White, which is gray! I’m trying to decide whether I use frosty white for the trim, or use more of a “true” white. It gets tricky trying to find a wall color when your trim color is not a pure white. This color is part of the Off-White Color collection. Inherently sophisticated and endlessly versatile, the Off-White collection offers subtle nuances of whites that suit tranquil, serene environments as well as creates color-enhancing accents for dynamic spaces. A compilation of 152 white and off-white colors. Do you prefer matte or semi-gloss for trim? Can you recommend Sherwin Williams paint colors for cabinets and trim? We are in the process of having our interior painted and our painter uses Sherwin Williams. I am not a fan of BM paint and was wondering if you could recommend a “super white” in another brand. I have very little natural light in my apartment. Much appreciated. I live in an older home (circa 1780) surrounded by tall shade trees so it is quite darke in the summer months. My go to trim white is Atrium white by Ben Moore. With a touch of pink (that you don’t see) it has a nice glow. Terrific article. I’d like to know the wall color in the last photos of the hallway. Thank you. This is a very nice article. However, my house had Sw Dover white on trims, baseboards and doors. I recently painted my kitchen cabinets with Sw pure white Without realizing the trim is right above the cabinets. I am wondering if I can choose a wall paint color that would offset the yellowness in the trims and cool stark white of my cabinets. 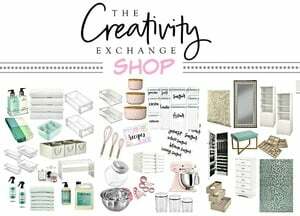 Love this post/info! What is the wall color in the last photo? It’s Benjamin Moore Stonington Gray. Hope this helps! 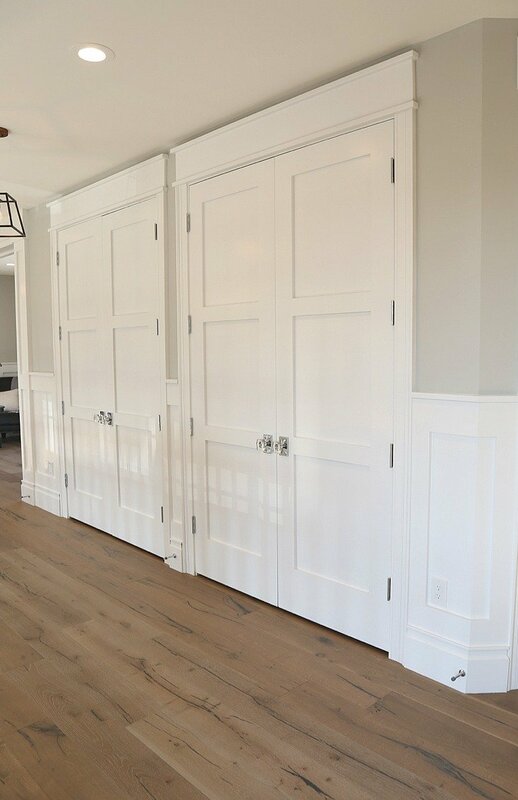 Went all eggshell white on all walls, semigloss on all wood trimand doors. Used 100 percent Benjamin Moore Chantilly Lace, and LOVE it!!! House has little east west light, some north until mid afternoon. This article was very helpful. Thank you! 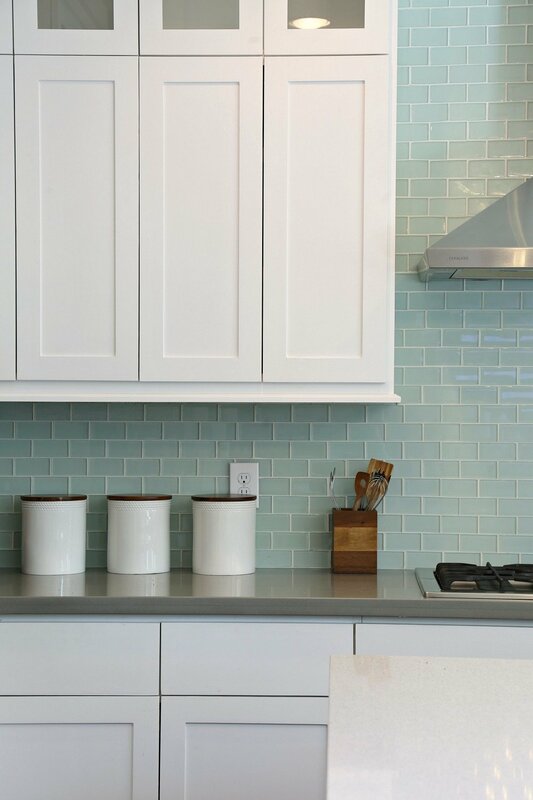 Do you recommend using the same white for trim, ceiling, and kitchen cabinets? I personally prefer it when all the whites in home are the same on trim and cabinetry. I just think it helps for a smoother transition/flow room-to-room. I do like SW Ceiling Bright White on the ceiling. It works with all whites. Thanks for your note! Brighter – BM Decorators White, and Brightest – BM Simply White again? The three that I mentioned in the post are bright-BM Simply White, Brighter- BM Decorator’s White and Brightest-BM Super White. Hope that helps. Please ignore my last comment. I completely misread your third trim color as Simply White rather than Super White 🤪. It must be the late night and lack of sleep! Haha! Thanks for another fantastic post! I love the last picture. what colors where used.What color floors are these. I have a small living room. I am wanting to use bright white for the trim. what color would you use for the walls? 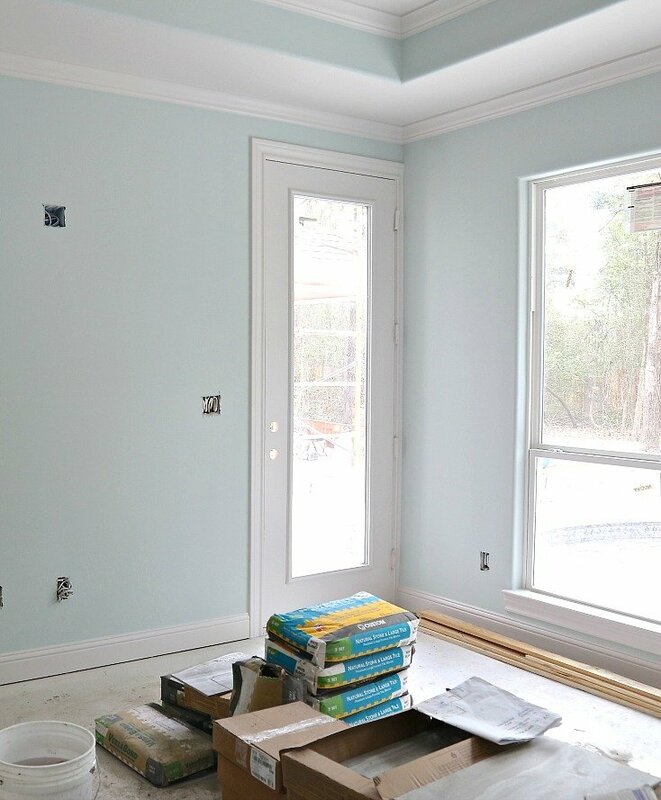 Are the ceilings painted the same as trim color but different finish? I noticed the white ceilings with Stonington Grey walls. I do not get much natural light. I have Behr Wheat Bread on my walls. What color do you recommend for the trim and ceiling? You say, “stay away from creamy off-white’s for trim color”. I have no white in my house at all! I like earth tones and warm colors. We recently expanded our dining room which is in the same room as the kitchen with a peninsula separating. We have oak cabinets in the kitchen with bisque appliances. In the dining room we have and, oak hardwood floor as well as oak table & chairs. Our sliding glass door and windows are oak as well. So to offset the natural wood, I decided to put raised paneling on the lower section of the dining room walls and the one kitchen wall that does not have cabinets. I wanted to paint it (no painted trim anywhere in my house up until now). The wallpaper in the kitchen has an off-white background similar to my bisque appliances. I custom matched the paint to that color. The dining room is on the dark side most of the time. I assume you wouldn’t make an absolute statement about the trim color; however, I don’t know what your reasoning was. I really like the color I chose. It compliments the rest of my house. I have to admit, I was going outside of my comfort zone even considering painting the trim around the oak window and doorways. The balance of natural wood and painted wood is perfect, in my humble opinion. Creamy off whites can look dirty or dingy, especially in certain light like dusk, dawn and at night with artificial light. To prevent that from happening, pick a balanced white that not only has warmth (to give it a off-white feel) but a white that has some coolness (I prefer 50/50 warm/cool). By doing this, the coolness in the undertone will offset the white from going too warm/dirty looking in those challenging lighting situations. Whites that have that warm/cool balance like Benjamin Moore Simply White or even Sherwin Williams Alabaster (which is even warmer) will be much better choices. The problem with color matching a creamy off-white is that it is very difficult to tell what’s in the undertone until you see it at dusk or in artificial light at night. You could end up with a peachy or mauve undertone that will jump out and you wouldn’t know it until it’s up on your trim. I hope that helps! Thank you for this post! I was having trouble finding the perfect crisp white that wasn’t too blinding for the exterior trim on my home. I actually typed in “exterior trim paint that is a crisp white but not too white” and found this post. I picked up a sample of Decorator’s White, and it’s just what we’re looking for! Sherwin Williams is going to color match it for us. I can’t wait to see the house painted now! I have natural ash floors and was thinking about Repose Grey. Would it look fine with that color floor and what white Sherwin Williams trim paint would you suggest? I have Decorators white on all my trim. It works beautifully in every room except my master bedroom. My ceiling is BM glass slipper and I can’t find a white for the walls. I don’t want bright white like Decorators…I’m looking for something softer maybe simply white or even moonlight white but I’m concerned about it looking dirty. Any suggestions would be greatly appreciated. The room is north facing with good light. When I came across this post my heart sank as I read your complete dismissal of Dover White for a paint trim color. My WHOLE house has Dover white trim even the exterior! Then as I read further, I realized that my house was completely painted over 10 years ago. I am currently having the interior repainted (next week) so I am contemplating having the trim painted a brighter white. My husband won’t be thrilled with the extra $ but I’m sure it’ll be worth it. I have always thought the Dover white looked a little dingy and now I know that it is! Thanks for the informational post! Can you please tell me the ceiling color? Is it decorators white as well? Painting house repose gray with decorators white trim and cabinets in the kitchen, but not sure what to do with the ceiling? Can you please let me know what color the ceilings are in the picture with decorators white trim and repose gray walls? What finish do you use on your super white? I’ll be painting trim, doors and kitchen cabinets. What finish do you use on the third white? Reading your other paint colors post, which trim color would you suggest for a darker ‘attic’ bedroom? BM Super White or BM Frostine? 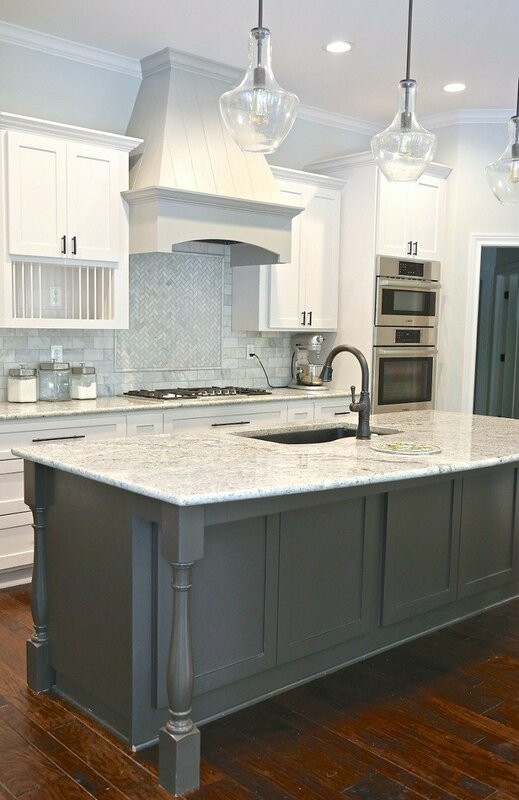 My teen wants to paint the walls BM Hale Navy, and I would like a crisp pop against the darker blue with not a whole lot of natural light..
I’m currently renovating my kitchen, and my cabinetry will be BM White Dove, and I’m leaning towards BM Satin Silver for my walls. Thinking of going with BM Simply White for my trim, thoughts? 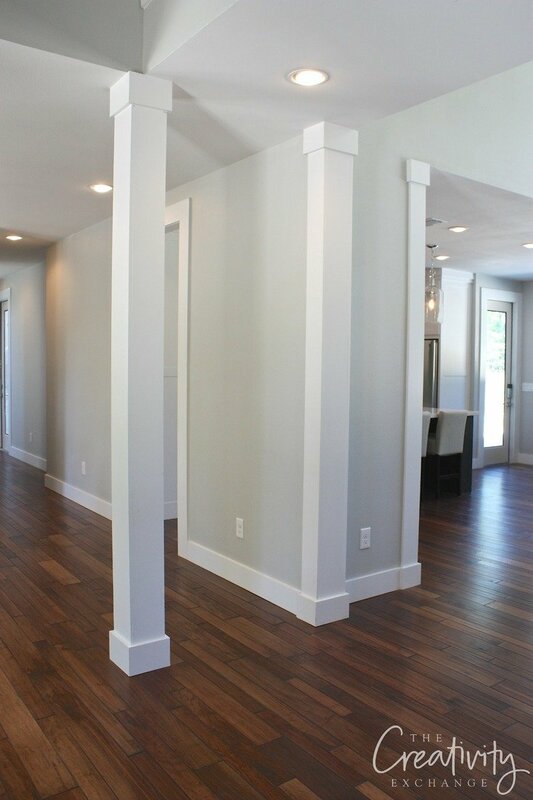 I am using BM Bennington Gray on the walls… can I use Super White on the ceilings (flat) and Super White on the trim and doors (eggshell)? It is a beach home, plenty of light and want a clean, crisp look to contrast. I currently have the Bennington Gray with the White Dove and you are so right… it looks dirty and dingy.